If there is a single cuisine that unites Durbanites across the demographic spread it is THE DURBAN CURRY. Hanging out at one of Durban’s countless curry joints, you’ll find everyone from skater kids to lawyers to street people who have managed to squeeze some coins together for that day’s lunch. Imported from India and then made brasher and hotter, the Durban curry might set your nose running, but it’ll also give your immune system a boost (chilli’s are rich in vitamin C) and give you a taste that you won’t be able to satisfy anywhere else in the world. 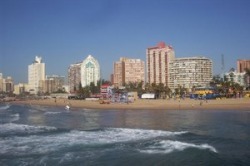 As well as these ubiquitous takeaways, Durban also has an array of traditional North and South Indian restaurants.